The Azure Kingfisher is a small kingfisher with a long slender black bill and a short tail. The head, neck, upper parts and breast sides are deep azure blue with a violet (purplish) sheen. The neck has a distinctive orange stripe on each side and there is a small orange spot before each eye. The throat is pale orange-white, grading to orange-reddish on belly and undertail. The flanks and sides of the breast are washed purple to violet. The legs and feet are red. The sexes are similar. Young birds have a darker cap and are generally duller. The Azure Kingfisher has a similar shape to the Little Kingfisher, but is much bigger and is distinguished by its orange underparts and violet sheen. It is much smaller and has a shorter tail than most of the kingfishers, which have white underparts and black legs and differs in particular from the similarly sized Forest Kingfisher, which has white underparts and a turquoise/green tint rather than violet/purple. 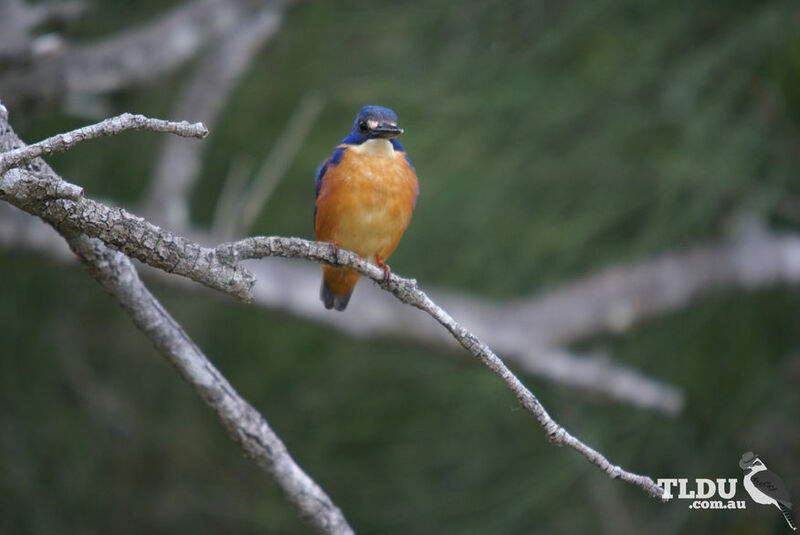 The Azure Kingfisher is found across northern and eastern Australia. In Australia, it is found from the Kimberley region, Western Australia, across the Top End to Queensland, and is widespread east of the Great Dividing Range to the Victorian border and south into Victoria. 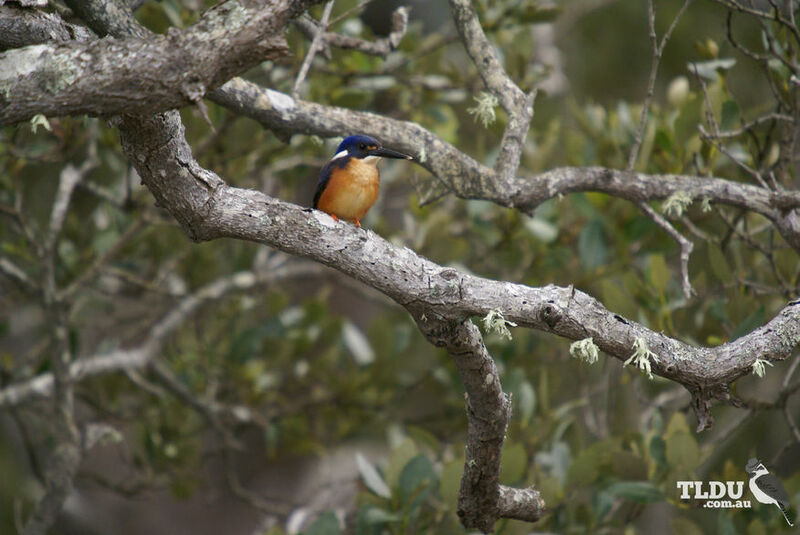 The Azure Kingfisher is never far from water, preferring freshwater rivers and creeks as well as billabongs, lakes, swamps and dams, usually in shady overhanging vegetation. It is sometimes seen in parks on rivers, as well as duck or goldfish ponds in urban areas. The Azure Kingfisher plunges from overhanging perches into water to catch prey. Prey items include: fish, crustaceans, aquatic insects and other invertebrates, and, sometimes, frogs. They will often bash their prey against the perch before swallowing it head first. Often watch Platypuses foraging underwater and catch any food items that are disturbed. Azure Kingfishers form monogamous pairs that defend a breeding territory. Both parents incubate and feed the chicks. The nest is at the end of a burrow dug out of soil in a riverbank. The tunnel slopes upwards to the nesting chamber and can be 80 cm - 130 cm long. Flooding can destroy low-lying burrows. Stock trampling vegetation around waterholes affects the Azure Kingfisher. Human activities that cause artificial flooding of waterways can drown nests. Water that is turbid (not clear) and the introduction of European Carp (which competes for food resources) can also adversely affect local populations.